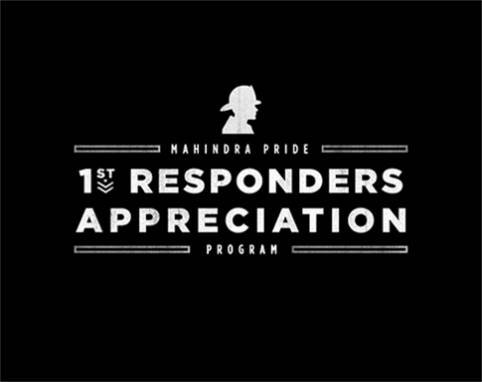 Mahindra Mahindra - First Responder Appreciation Program Promotion Details | Available at Mountain Motor Sports Inc. Active and retired personnel receive a $100.00 rebate with the purchase of a new Mahindra Tractor with two qualifying implements, or UTV. *Visit your dealer for details. In honor of our community heroes, this offer is available to ALL active duty, retired, and Honorable Discharged employees of Federal, State or Local Law Enforcement/Firefighter/EMT. Offer in U.S. Dollars. PURCHASE: Purchase a new Mahindra tractor with two qualifying implements or UTV and receive a cash rebate of $100.00. This offer is available to ALL active duty, retired, and Honorable Discharged employees of Federal, State or Local Law Enforcement/Firefighter/EMT. To qualify please send proof of your active duty, retired, honorable discharge or employment status attached with a copy of your driver’s license. Proof–of–Purchase invoice must clearly indicate the purchase date, dealer name, address, model and description of the Mahindra tractor and implements or Mahindra UTV and retail price of each. Rebate claims must be submitted within 30 days from the purchase invoice date to qualify for payment. Backhoe and Mid-Mower qualify with the purchase of one implement listed above. Loader, Quick Hitch, 3-Point Bale Fork or Spear, Trailer Mover, Trailer Mover Bale Spear Combo, Potato Plow, Boom Pole, Bolt- on Bucket Spear do not qualify. The Mahindra brand must be CLEARLY indicated on the dealer invoice for the qualifying tractor and implements or UTV purchase. This rebate is for new Mahindra tractors or UTVs ONLY. Vehicles that have been on the loaner program over 30 days are considered used. Please confirm loaner status with your dealer. Use of fictitious names or addresses to fraudulently obtain additional redemptions is a violation of federal law and may result in prosecution and a term of imprisonment, fine or both. Trading or selling proof–of–purchase is strictly prohibited. This offer may not be published in any publication without written permission from Mahindra North America. Void where prohibited, taxed or restricted by law. Offer good in USA and Canada only. Allow 8 weeks from date of submission for receipt of your rebate check. Offer expires 6/30/2019. All claims must be submitted by 8/1/2019. Program rules subject to change without prior notice.